Hi guys, You must have gone through numerous articles or blogs on internet, newspapers or might have attended any seminar based on JEE preparation. And I am sure that through all of these sources you must have got a common information that5 how to prepare for JEE, which portion carries what % of weightage, related topics, most frequently appearing topics but none of these must have shared the sure shot pattern of question most likely to come in JEE. Yes, you read it right, in this blog, I am going to talk about these 7 sure shot topics that will come in JEE 2018. And, how did we do that? Well, we have a team of experts (ex-IITians to be very precise) working consistently to analyze past few years paper pattern upto the level where they can almost predict JEE Mains and Advanced exam paper for the year 2018. 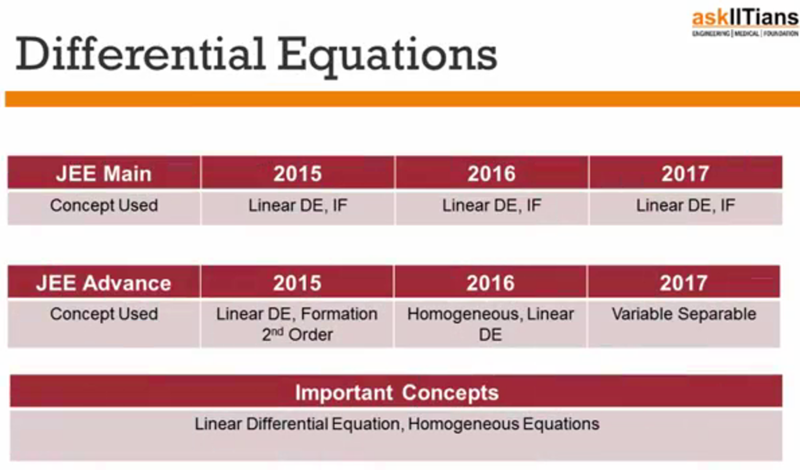 Recently, we conducted a detailed webinar on it taken by our Mathematics expert Mr. Harsh Patodia (IIT-Roorkee) and if you missed out on this then I will be sharing you those 7 hot topics and example of questions that can come in exam. However, the video of this webinar is also shown below but you your quick access I’ll be sharing those topics and questions as well. This is one of the most important topic and highly based on your conceptual understanding. 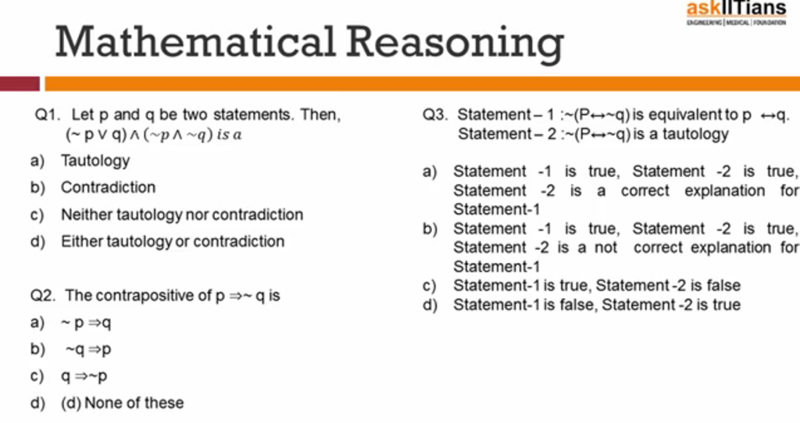 It generally consists of statements from Tautology, Fallacy, Contrapositive Statements, Equivalent Expressions, Truth Table. Below is the analysis how this topic has been used in JEE exam in past 3 years. Now, what you need to remember here is that Tautology and Fallacy are favourite of examiners in JEE Mains but not much favored in JEE Advanced. And you can expect 4 marks question straight from these topics in JEE Mains. And these 4 marks are very important considering the fact that they can increase your rank by thousands. The second topic that will come in the exam is Probability. Talking about the favourites, Classical probability is the one in JEE Mains and Bayer’s Theorem in JEE Advanced. Both of them will surely come in JEE Mains and JEE Advanced respectively. Below is the analysis how this topic has been used in JEE exam in past 3 years. Now to explain this, I have presented an example of question type from these topics. 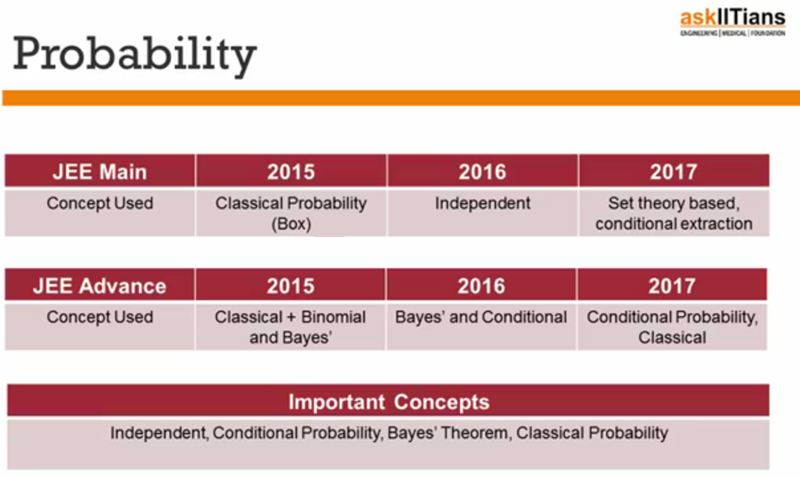 While preparing for JEE Mains you need to remember that questions from Conditional Probability and Bayer’s Theorem are lengthy compared to Classical Probability thus avoided in JEE Mains. 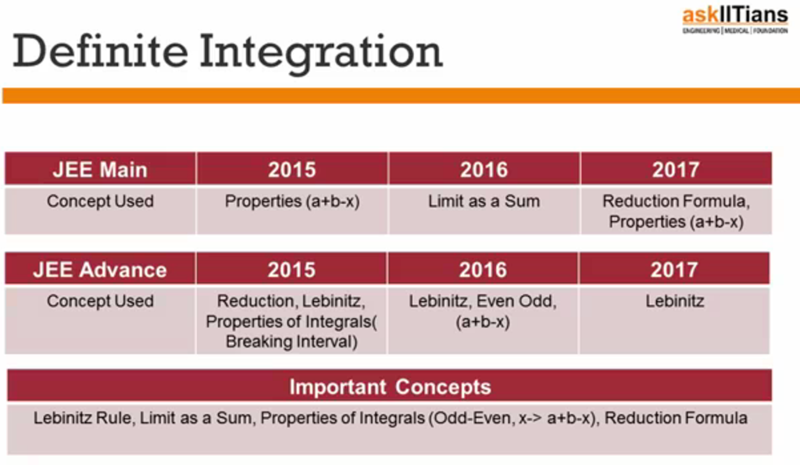 Well, Integration is one topic that is hated most by JEE aspirants but it is favourite of examiners, Definite Integration in JEE Mains and Indefinite Integration in JEE Advanced. The important concepts from this topic and how they have appeared in previous papers is shown in the analysis below. And now I present a question as an example that how any of these concepts can come in exam. Here, you need to remember that Lebitz Rule is examiner’s favourite and Limits as a sum will surely come as one of the concepts in JEE Mains. Well, this is one of those topics which can fetch you marks not even in JEE Mains but also in JEE Advanced as it is the most frequently appearing topic in both the exams. 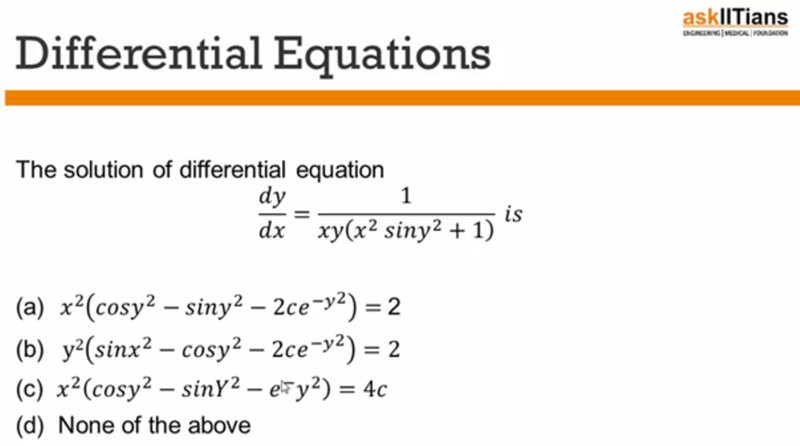 The two important concepts covered in this topic are Linear Differential Equation and Homogeneous Equation. The analysis is shown below. An example of the question on these topics is as follows. Also, for your information, Linear Equation has appeared in almost all Engineering exams conducted in India in past 10 years. And, this itself makes it clear that how important this topic is. This topic is mainly based on Functions, Graphing, Solving the Equations and marking graphs. There won’t be any direct question on this topic, they all will be concept based. Now, let me show you the analysis that our experts have done on this topic. And the example of frequently appearing question types is. In Area under the curve, Parabola is frequently repeated concept. And, if any of you is facing problem in understanding this topic then you can refer to a book specifically for this topic “Playing with graphs” by Mr. Amit M. Agarwal (Arihant Publication). Well, out of all the topics being discussed here, Functions is the most conceptual based chapter and there is a guarantee that you will not get any direct question from it, be it JEE Mains or Advanced. And a sound understanding of this topic will help you in cracking other topics such as Application of Derivatives and Integration. Here, you should remember that greatest integer and MOD function are the most frequently appearing concepts. And an example of question is as follows. One thing to keep in mind is that Functions should be the first chapter on the list while preparing for Calculus as it is used in almost every topic of it. Also, you need to understand that “Functions” is not much favoured in JEE Mains but is hot favourite in JEE Advanced. Limits is one topic which has very limited concepts but if you master it then you can easily excel in both JEE Mains and Advanced. Let me show you an analysis that it has appeared in previous exams. The example of question that comes in the exam is mentioned below. Limits is one of the topics that comes in both JEE Mains as well as Advanced. Now, I am sure that after going through all the concepts mentioned above and in the webinar you are definitely eager to get the same level of knowledge on Physics and Chemistry as well. So stay tuned with me as we’ll be back with 7 sure shot questions from Chemistry and Physics as well.